Bay Ledges is a passion project created by Zach Hurd. The project began after he moved from New York to Los Angeles to pursue his career in music in a new space. 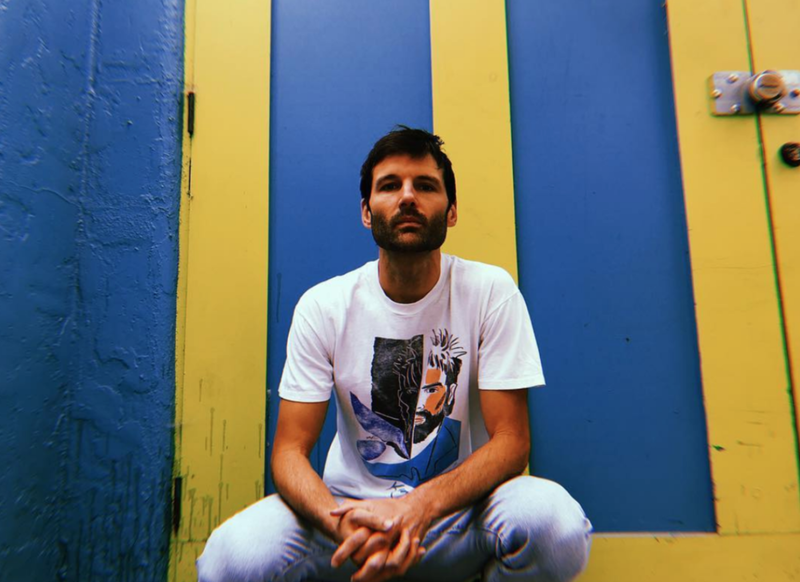 Previously a singer-songwriter, Hurd has created an electro-pop sound beginning in his bedroom -- using his self-created guitar and drum loops, and background vocals from his sister, Georgia. Growing up in a coastal town of Maine, Bay Ledges is named after the woods he calls home. Bay Ledges has been viral lately in the Spotify realm on playlists like The New Alt and the 2017 release, ‘Safe’ has over 7 million Spotify plays. ET: Thanks for chatting with me! I think I first heard your music on a Spotify playlist. I love the free electro-indie sounds. What inspired that sound? ZH: I’ve always loved electronic and indie. I like music that uses samples, so I wanted to see how I could make the music seem sample-y. I’d sample my own voice or my sister, Georgia’s, and play with it. ET: Any artists that inspired you? ZH: Yeah more recently Toro y Moi and Washed Out. Hearing bands making music that feels tape-y and analog. I love those kind of sounds. ET: I’d love to hear how you started playing and your transition from NYC to LA. I know it was rooted from a passion project. What were some obstacles you had to face? Any lessons learned along the way? ZH: I actually moved to New York and lived there for a while for music. I was pursuing singer-songwriter thing, which is very different from Bay Ledges. I was way more reserved on stage and terrified. I moved out to LA three years ago. I had a 9-5 in New York at the Metropolitan Museum of art, and it was a cool job. It became really tough to balance both music and work. I got to the point of like ‘I don't know if this is much fun anymore.’ When I was thinking about leaving New York, I was thinking about moving to LA or Nashville. Both of my sisters were living in LA, and actually Georgia was in the band for a bit. It was great moving there, because I was working on the project, and she lived down the street and come sing on some of the tracks. Moving to LA was a major turning point for me. I stopped doing the acoustic songwriter thing, and I spent more time on the music and having fun with it. ET: How did you guys learn you had a musical talent? Have you always played when you were younger? Did you grow up in an artistic/creative environment? ZH: I started playing guitar right out of high school. I was terrified to sing in front of people. I remember doing an open-mic night with a friend, and it was a terrible song. I remember my face like bumped into the mic because I was so nervous. I remember it was a cool moment though to share something with people. I always had a deeply personal feeling about music. In college, I would play music in my dorm room and I remember this one night my friends were like ‘we can always here you in your room. You should play us something.’ I was pretty tipsy, and I did. They were like all blown away, which was a cool moment. After that, I knew this was something I wanted to do. ET: Have you always been pretty creative? ZH: I used to be super into drawing and I wanted to be a cartoonist when I grew up. So it was this hobby I’d do for hours. Once I started playing, music took over that creativity. It was a way for me to get in touch with what I’m feeling. ET: How have your experiences been touring with Yoke Lore? Adrian seems like a very empathetic and kind person who has amazing experiences. ZH: I’ve never met him before this third show actually! I don’t know him super well, but he does have that very grounded, zen vibe. ET: You describe your sound as soulful, glitchy-pop. Tell me more about what that means to you? ZH: Glitchy refers to the chopping of the sounds and guitars. It speaks to the sound. I also love a good pop song. Pop music lives in the sound, but I love creating pop in a new way. ET: I’ve heard you describe your sound as nostalgic? I can sense that in your band title being named after a place in Maine you grew up and ‘I remember’? Tell me more about the nostalgic aspect? Is that something you try to carry throughout your songs? ZH: Yeah! So it’s named after some land my grandparents own in the woods of Maine. I remember playing and just spending a lot of my childhood there. The song I write called ‘Tween Love’ was about that awkward feeling, going to school dances, and going back to the time when music was really fun for me. When I started the project, I was like how do I connect back to the time when being creative was so great. I try to keep it nostalgic, but sometimes it keeps tricky to hold on to what is your vision for the songs. It’s sort of been an experiment, allowing myself to write with other people. I think inherently there is a nostalgic quality to some of it. ET: How do you hope your listeners feel when they listen to your new single, ‘Wherever You Sleep’ and the new tunes? I love the artwork for ‘Wherever You Sleep.’ Does it have any meaning to you as a band? ZH: The song was the first co-write I ever did over a year ago. It had this line ‘gotta get you out of my head.’ I put the song away because it didn’t feel like me. About 4 months ago, I met with a producer who worked with St. Vincent and The Dirty Projectors. He heard the song, and he loved that line so we kept that. I went back though and re-wrote the verses. When I was writing the verses though, I was going through a breakup and a lot of other things. The verses seem sad, but there’s also an optimism to it. I love when a song is sad, but feels hopeful. The artwork was created by a designer, Cale Potts. A year ago I discovered how he reached out and loves making art for bands. His whole Instagram page is dedicated to art for bands actually. He will pick a song and create a piece. He made one for my song, ‘Mango’ too. For this song’s artwork, it’s all about the desert and different things coming out of this one guy’s head. I thought it was a cool concept. ET: When you’re on tour? What are your must-do’s or see’s of a city? Any places you haven’t been? ZH: This is our first tour! That being said, I’m so excited to explore. Although, it’s hard to take the all the places in because our time in each place is so short. ET: What are a couple of things you want your fans don’t know about you? Or you’d like to share? ZH: I want people to come out and feel good. I love dancing even though I’m not really good at it. But it’s such a freeing thing to move your body on stage. I love when I’m at shows, when I see people doing that too. The goal here is to make people feel free and to have a fun time at the shows. ET: What should we expect this coming year music-wise? ZH: We’re releasing some new stuff at the end of November and in early 2019. Bay Ledges is currently on tour this Fall with Yoke Lore and Magic City Hippies. The new EP is also out 11/130. Check out Bay Ledges also on Instagram and their new video for their latest release, ‘Wherever You Sleep’ on YouTube.